Absolutely you could. The PID will work fine and you could just buy a contactor with a 220v coil in it. In my case I was also running a number of 110v items so I was breaking down the 220v anyway. I just felt it was easier to run everything at 110v except the elements especially when some of the items are not available or more expensive in 220v. I'm doing good... way too busy at work but doing good just the same. I'm not sure I'm following exactly what you are doing. If I'm reading this right you are wanting to run 2 temperature probes off the one controller. One for the cabinet and one for the meat. If this is the case it is not possible. Each PID controller can only have one thermocouple. Basically in the setup I have one PID and thermocouple control the temperature of the cabinet. The second PID and thermocouple monitor the cabinet for an overheat situation and if it happens it kills the power to the elements. You could have a setup with a third PID and thermocouple to monitor the meat. I would have to think through the wiring for it but I'm sure it's possible. I know Auber has there Plug & Play Dual Probe but I have never studied it or talked with Suyi Liu about it. I do know at one time Suyi was going to work on a PID that was capable of dual probes but I don't think it ever happened. 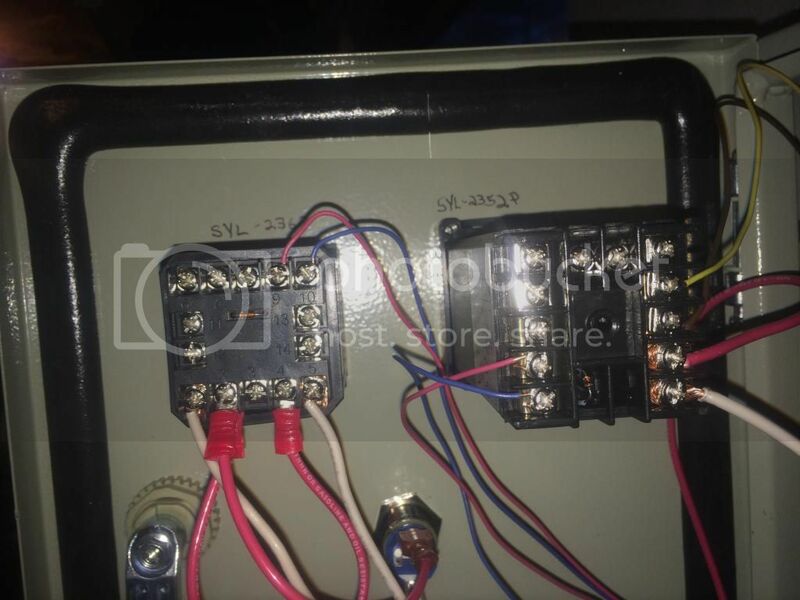 I am having a problem with my control cabinet, I wired to your diagram and I cant seem to get any power to far side of contactor,in your 220 diagram it seems both black and red hot leads are coming into my 120v contactor(correct? )and im getting no power to the far side of said contactor.i do get power to my switch,comming of the hot side of contactor but nothing powers up? am I supposed to break one of those legs down? If you have it wired correctly you would turn the toggle switch on which allows power to flow to the 2362. You would fire up the 2362, program it as a high limit (OUTY=5) , then push and hold the Set button for 5 seconds which will engage the contactor. Once the contactor is engaged the rest of the system should have power at that point. Your correct that both legs of the 220 are switched by the contactor. The only part of the contactor that is 110 is the coil. Although you are pulling 110v off one leg to provide power for a number of things. It looks like you are coming along pretty good with your project. 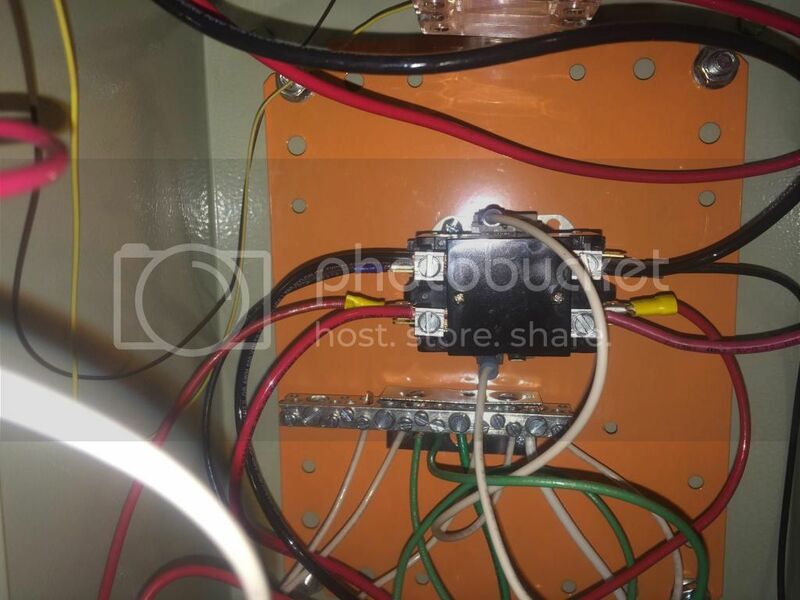 that seems to be the problem when I fire it up there is only power to the push button switch, when I press the switch nothing happens, in my pic do the wires on the top and bottom of the contactor appear to be correct? also the controller I bought is different then the one in you drawing (does that make a difference? it just seems there should be power to the 2362 when I push the button, with the tester there is power at both sides of the switch but no power at the controller weird eh? I'm thinking you do have some wiring wrong on the 2362. The wiring diagrams of mine you are looking at have a 1512 as the high limit and the terminals are wired differently. 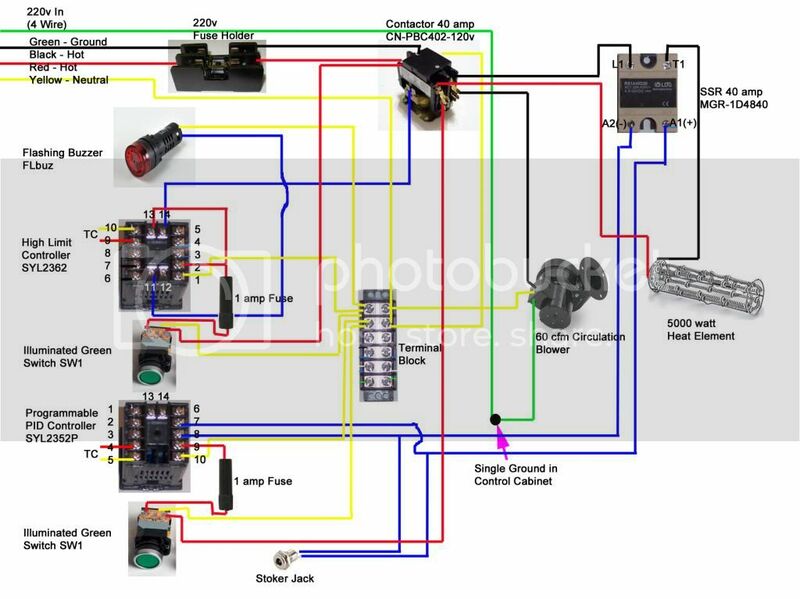 Here's a wiring diagram I did for another guy who was setting up a large smoker for a commercial setup. Just disregard the wiring for the Stoker Jack and the Flashing Buzzer. I guess there's also an extra switch on the 2352P in this one as well. You could just skip the switch and once the contactor is engaged the 2352P would come to life. Keep us posted how things go! Or anyone else that is interested. Probably too late for you Jason but Suyi Liu from Auber Instruments just sent me an email regarding a new Dual Probe PID Controller as a component that he will be selling. Looks like a real nice option for anyone who is putting together their own PID. I've never found any dual probe PID components before and certainly not anything as reasonably priced. Here's a link to the new product page if anyone is interested.